Pass through means to move your needle in the same direction that the beads have been strung. Pass back through means to move your needle in the opposite direction. Tie off your old thread when it's about 4" long by making a simple knot between beads. Pass through a few beads and pull tight to hide the knot. Weave through a few more beads and trim the thread close to the work. Start the new thread by tying a knot between beads and weaving through a few beads. Pull tight to hide the knot. Weave through several beads until you reach the place to resume beading. A tension bead (or stopper bead) holds your work in place. To make one, string a bead larger than those you are working with, then pass through the bead one or more times, making sure not to split your thread. The bead will be able to slide along, but will still provide tension to work against when you're beading the first two rows. Follow the manufacturer's instructions for warping your bead loom. Note that you will need one more warp thread than you have number of beads in a row. To weave the beads, tie a thread to an outside warp (tie onto the left warp if you are right-handed, the right warp if you are left-handed). Use a needle to string the first row of beads and slide them down to the knot. Bring the beaded weft thread under the warp threads and push the beads up with your fingers so that there is one bead between each two warp threads. Hold the beads in place and pass back through all the beads, making sure that the weft thread passes over the warp threads. 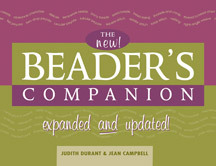 End your threads by weaving back through the beadwork, tying knots between beads. Stringing is a technique in which you use a beading wire, needle and thread, or other material to gather beads onto a strand. Using two needles, one threaded on each end of the thread, pass one needle through one or more beads from left to right and pass the other needle through the same beads from right to left. Continue adding beads by crisscrossing both needles through one bead at a time. Use this stitch to make strings of beads or as the foundation for brick stitch. For a single-needle ladder, string 2 beads and pass through them again. String 1 bead. Pass through the last stitched bead and the one just strung. Repeat, adding one bead at a time and working in a figure-eight pattern. Begin by creating a foundation row in ladder stitch or using a secured thread. String one bead and pass under the closest exposed loop of the foundation row. Pass back through the same bead and continue, adding one bead at a time. To decrease within a row, string one bead and skip a loop of thread on the previous row, passing under the second loop and back through the bead. To increase within a row, work two stitches in the same space of the previous row. One-drop peyote stitch begins by stringing an even number of beads to create the first two rows. Begin the third row by stringing one bead and passing through the second-to-last bead of the previous rows. String another bead and pass through the fourth-to-last bead of the previous rows. Continue adding one bead at a time, passing over every other bead of the previous rows. Two-drop peyote stitch is worked the same as above, but with two beads at a time instead of one. String an even number of beads and make a foundation circle by passing through them two more times, exiting from the first bead strung. String 1 bead and pass through the third bead of the foundation circle. String 1 bead and pass through the fifth bead of the foundation circle. Continue adding 1 bead at a time, skipping over 1 bead of the first round, until you have added half the number of beads of the first round. Exit from the first bead of the second round. String1 bead, pass through the second bead added in the second round and pull thread tight. String 1 bead and pass through the third bead added in the second round. Continue around, filling in the ''spaces'' 1 bead at a time. Exit from the first bead added in each round. String a crimp tube and pass through the connection finding. Pass back through the tube leaving a short tail. Use the back notch of a crimping pliers to pinch the tube into a U, leaving a wire on each side of the bend. Rotate the tube 90-degrees and use the front notch to form the pinched tube into a clean cylinder. Begin with a foundation row of ladder stitch. Join the ends together to form a tube. String 2 beads. Pass down through the next bead and up through the bead after it. Repeat around the tube. At the end of the round, pass through the first beads of the previous and current rounds to step up to the new round. Begin with a foundation row of even-count ladder stitch. String 2 beads, pass down through the second to last bead in the ladder, and up through the next bead. String 2 beads, pass down the next bead and then up through the following. Repeat to the end of the row. To end the row, pass back through the last bead strung. To begin the next row, string 2 beads and pass down through the second to last bead of the previous row. Repeat, stringing 2 beads per stitch and passing down then up through two beads of the previous row. The 2-bead stitch will cause the beads to angle-up in each row, like a herringbone fabric. String 4 beads and pass through them again to form the first unit. For the rest of the row, string 3 beads, pass through the last bead passed through in the previous unit, and the first two just strung; the thread path will resemble a figure-8, alternating directions with each unit. To begin the next row, pass through the last 3 beads strung to exit the side of the last unit. String 3 beads, pass through the last bead passed through, and the first bead just strung. *String 2 beads, pass through the next edge bead of the previous row, the last bead passed through in the previous unit, and the last 2 beads just strung. Pass through the next edge bead of the previous row, string 2 beads, pass through the last bead of the previous unit, the edge bead just passed through, and the first bead just strung. Repeat from * to complete the row then begin a new row as before. Begin by stringing a base row of 13 beads. String 5 beads and go back through the fifth bead from the end of the base row. String another 5 beads, skip 3 beads of the base row, and go back through the next. Repeat to the end of the row, passing through the fifth, fourth, and third beads of those just strung and exiting from the third. Turn the work over and go back across the same way. Using two needles, one on each end of the thread, string three beads on one of the needles and slide them to the center of the thread. String a fourth bead, passing one needle through from left to right and passing the other needle through from right to left. String one bead with each needle, then pick up one more bead and pass one needle through from left to right and pass the other needle through from right to left. Continue for desired length of row. To work the next row, repeat as for the first row, stringing new beads only onto the right thread and passing back through beads from the first row with the left thread. To make a row-end decrease, simply stop your row short and begin a new row. To make a simple loop, grasp one end of the wire with round-nose pliers. Holding on to the wire with one hand, gently turn the pliers until the wire end and wire body touch. Create a 90° reverse bend where they meet. For a wire-wrapped loop, cut the desired length of wire and make a 90-degree bend 2 inches from one end. Use round-nose pliers to hold the wire near the angle and bend the short end up and around the pliers until it meets itself. Wrap the wire tightly down the neck of the wire to create a couple of coils. Trim the excess to finish.